No one will soon forget the bold statement made at the 2018 Golden Globes. As you already know, the red carpet was a sea of black in support of the Time's Up initiative, which provides legal aid to victims of sexual harassment and abuse. 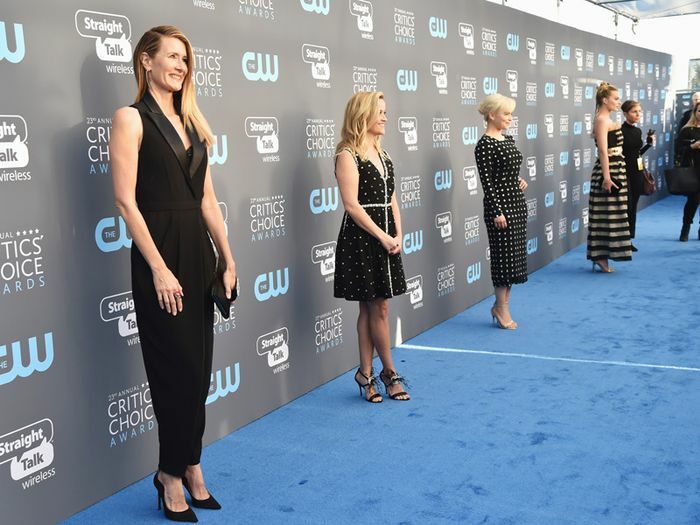 Although the red carpet at last night's Critics' Choice Awards featured a wide range of colors, some of the biggest advocates for Time's Up continued their show of solidarity by wearing black dresses and furthering the conversation. Reese Witherspoon, who has been one of the most outspoken voices for the initiative, opted for a short black Prada dress for the ceremony. Her fellow Big Little Lies co-star, Laura Dern, also donned head-to-toe black, as did Game of Thrones' Emilia Clarke. Although Gal Gadot wore a silver Prada gown to the Critics' Choice Awards, she honored Time's Up with her acceptance speech. "We’ve been witnessing a movement in our industry and society, and I want to share this award with all the women and men who stand for what’s right," she said onstage, per Vanity Fair. "We will continue to band together to make strides uniting for equality." Amen to that. Read on to see some of our favorite black dresses of the night.